Offshore Technology Conference May 6-9 | FUCHS LUBRICANTS CO.
FUCHS Lubricants Company is excited to announce it will be participating in the Offshore Technology Conference (OTC) along with the world’s energy professionals. OTC is the largest global event for the oil and gas sector featuring approximately 2,000 exhibitors and attendees from across the globe. 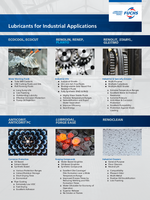 Stop by to discuss our unique, and specialized lubricants designed for the oil and gas industry. Our OTC experts will be available to discuss custom solutions for your unique challenges.